The best way to proceed with confidence is to be armed with questions based on knowledge and experience from the flight training industry itself. The following are the questions you should ask and issues you should address to help you make the best decision when choosing a flight school. When you begin your search, you’ll undoubtedly start by looking for flight schools in your area. With any luck, you will have several from which to choose. Search the Internet for flight schools and visit their web pages to see what they offer, how their programs are structured, if they appear to have an ample fleet of training airplanes, and an otherwise vibrant and active training operation. If a flight school advertises that some of its airplanes have “glass” cockpits, that’s a good thing. This means that its planes are equipped with the latest technology and instrumentation common to modern airplanes. Related Content: Should You Fly Under BasicMed? It also makes sense to see if the school has an advanced flight simulator you can use during your training. Having access to a quality simulator will save money, add convenience, and decrease the amount of time it will take you to earn your private pilot certificate. The simulator should replicate the same airplane you will train in, with the same flight characteristics, and the same controls and instruments in the cockpit. After getting an initial sense for each flight school in your area, it’s time to visit them in person. Call to make an appointment. Your first impression as you enter a flight school should be one of organization and professionalism. You should be able to imagine yourself spending time planning flights, debriefing flights with your instructor, and being generally comfortable and able to perform those ground-based tasks necessary to earning your pilot certificate. First and foremost, a school needs to have a published curriculum that you’ll follow. You should be able to get a copy of the syllabus that outlines everything you’ll need to do to earn your pilot’s certificate. If a school doesn’t have a curriculum and a syllabus that they can show you, you should walk away. Without a clear plan and an instructor who follows that plan, you’ll waste a lot of time and money. In general, there are two types of flight schools, ones that have an FAA approved program (called Part 141) and ones that for some reason don’t (called Part 61). While most people would benefit from training at a Part 141 school, there can be valid reasons to learn under Part 61. Make sure you ask the school if they have a Part 141 approved program and if they don’t, ask them why. They might have a very good answer, and as long as the training follows a curriculum, you should be open to it. The flight school instructors and staff you meet with should be professional in appearance and demeanor. Depending on the flight school, you may find that many of the instructors are on the young side of life. This is common and typically not a red flag. Most future airline pilots work as flight instructors for a year or two before they have accumulated enough flight time to become eligible to fly for the airlines. These instructors are well-educated and perfectly capable of teaching you how to fly, but there is a caveat about which you should ask: How long will the instructor assigned to you be at the school until they move on to fly for the airlines? Could they leave half way through your training? This is a double-edged sword, because the instructors with a lot of experience also tend to be better at getting student pilots through training efficiently. On a gut level, you need to feel comfortable with any instructor from whom you receive instruction. You will be spending many hours with this individual. If you know ahead of time that your instructor will be leaving before your flight training is complete, be sure to identify the instructor who will take his or her place, and that you feel good working with them. All the apparatus used for training, including the airplanes and simulators, should appear to be in excellent condition and instill a sense of confidence that you will be learning to fly in a professional environment with well-maintained equipment. Aircraft availability can be a huge issue and you’ll want to make sure the school has enough resources and a process in place to manage those resources. Keep in mind that you likely will have to adjust a lesson or two during your training no matter how well the school manages its fleet. This is one of many reasons that it makes a lot of sense to choose a flight school that has advanced flight simulators. They are a great tool to keep your training on-track. In addition to having ample and well-maintained equipment, the school needs to give you reliable access to it. You’ll be with your instructor for the initial part of your training, but after your first solo flight, you’ll find that an increasing amount of your training is done on your own. Having access to the flight school facilities, a simulator, and an airplane on your own time is critical to ensuring that you can move through your training as efficiently as possible. No matter where you are in your training, spending time by yourself in an advanced simulator provides irreplaceable experience that will reduce the amount of time and money needed to earn your private pilot certificate. There are some other key questions you should ask during your visit as well. These are questions good flight schools will be glad you asked. Find out how long the flight school has been in business, how many clients they have graduated, reasons for any student failures, what other training and safety programs they offer licensed pilots, how their business is structured, and how and when the school will charge you as your training progresses. Some flight schools will ask you to sign a long-term contract. Ask if there are other options available. It’s also worth your while to ask the flight school what makes them better than the others? Why should you choose them over the flight school next door? This gives the flight school an opportunity to give you information you may not have thought to ask about…or a good reason to disqualify the school from consideration. Find out what the school’s first-try pass rate is for student pilots taking their final check ride. This is one of the most important indicators of the quality of a flight school. A good flight school should see almost all their students pass their check ride on the first try. Failing should be a rare exception, because most reputable flight schools over-prepare their students. It’s important to note that just because you are over-prepared for your check ride doesn’t mean you are spending more effort, time, and money than is necessary to become a pilot. Not at all. Passing your FAA check ride simply means that you have met the minimum requirements needed to earn a private pilot certificate. But, as you will learn during your training, the real goal in learning to fly is to become a safe pilot, and that means exceeding minimum standards. All these questions are important, but perhaps the most important information you can gather from a flight school is the contact information of past and present students. This way you can talk to people who are going through, or who have gone through, a flight school’s program. These individuals can confirm the answers the flight school gave you and offer even more information about what it’s really like to be a student in its program. Choosing the best flight school for you can be a daunting and time-consuming process, so we put together a checklist you can print and take with you when you visit a new school. All the topics covered in this article are addressed, and a few more. 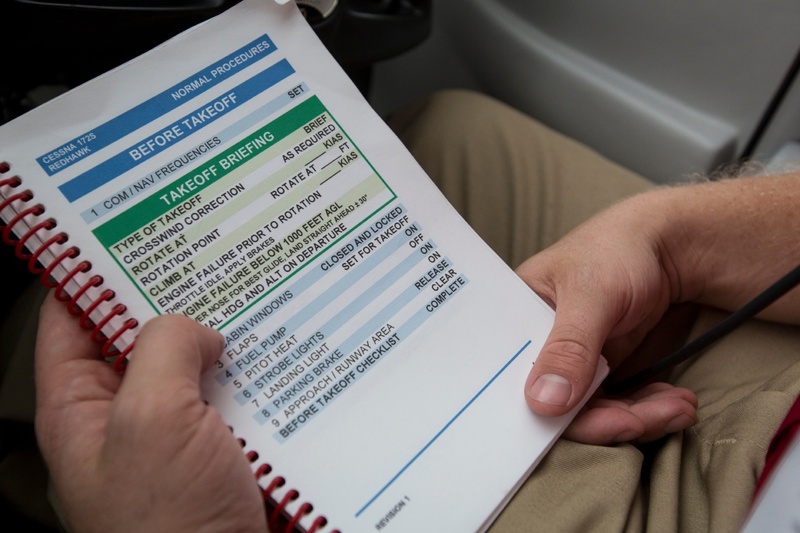 Armed with this checklist, you’ll find yourself in the cockpit in no time, confident that you are receiving the best flight training available.